Before the season opener against the 1. 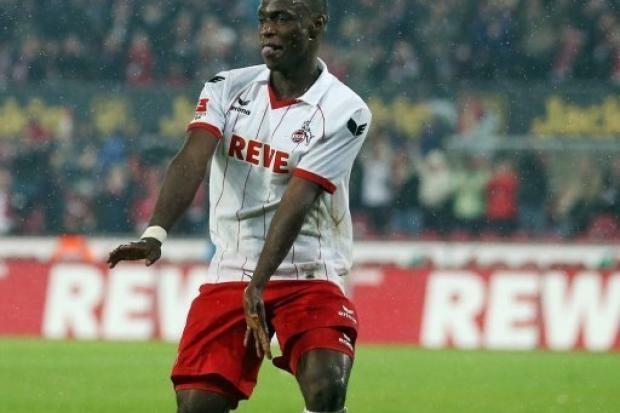 FC Köln, we spoke with Anthony Ujah, the most-reliable goal scorer of the past season for the Cathedral City-ites. In the past season, the Nigerian showed his best form and managed 13 goals in 28 matches. As the player had only been borrowed from FSV Mainz 05, those in charge in Köln decided to acquire the attacker. We spoke with the 22-year-old about the Confederations cup, the selection to the Nigerian team, and the upcoming second-league season. Additionally, the center striker reveals why he is looking forward to the match in Dresden. Playing to the boisterous crowd, Tönn? Anthony, in the past season you drew positive attention to yourself with your 13 goals. Though one could assume you had offers from clubs higher in class, your decision landed on Köln and against Mainz or another first-league club. Do you prefer the Kölner Karneval to the one in Mainz? There were other possibilities, but I never made a secret of the fact I wanted to remain in Köln. I had a good time here and can continue to develop myself. I feel comfortable in Köln and am proud that I can play for such a large club. I am glad I’m am now here permanently and can make Köln my home. And, additionally, the Karneval in Köln is much better and larger than in Mainz. It is super to look on the many happy faces at Karneval – I’m already looking forward to the next one. Ujah loves the Karneval in Köln. Does he also dig the Brings? You’ve had little time to regenerate during the summer break, as you were with the Nigerian national team at the Confederations Cup in Brazil. What are your impressions of the nations and its people? The people there are very friendly. Brazil is a huge football nation and everyone knows something about the sport. As we walked through the streets with the team, you noticed how excited the people were and how much they were looking forward to the World Cup. For us it was a nice experience, and we definitely want to qualify for the World Cup, so we can be there again soon. Brazil has a way of making you smile. You had the opportunity to measure yourselves against the World and European champions Spain. Though you, yourself, were denied the chance to play, you were still able to observe the Spaniards up close. Is Spanish football currently the best? It was beautiful to watch the world champions play from so close. It is a great team; hence, we can be proud of our effort despite the loss. The way Spanish players like Xavi or Iniesta move is like from another league. Their game is incredibly fast. Now the second-league season for 2013-13 begins. What goals have you set in the new for yourself personally and with the 1. FC Köln? I’d personally like to further improve my game with the help of the new trainer. Otherwise, I have no personal goal, rather want only to help the team. For me is it more important that the team manages promotion – and not that I become the top goal scorer. Happy for team success, even when wearing street clothes rather than scoring a heroic goal. My kind of player. Right at the very start is the away game at Dynamo Dresden. The Dresdeners will compete against you in front of a sold-out house. Is such a scenario exactly what a footballer wishes for from in the first game for points? Yes. It’s always super to play in a sold-out stadium. At the last match in Dresden, the fans were very loud and it was impressive to see such passion. But our fans are also fantastic. The match, in this early phase of the season, will be more difficult for both teams than the last. Please let me stay with the Effzeh! PLEASE! Anthony, many thanks for the interview! Be the first to comment on "Effzeh auf Englisch: Dynamo-Dresden.DE’s Interview with Anthony Ujah"
American Geissbock must get to Florida Cup . . . somehow . . .